Suddenly the rural roads of East Northamptonshire fell quiet. Dogs out for a morning walk no longer threw themselves to the pavement as it passed. The man in beige slacks with the caravan on his drive who for a long hot summer shook his fist as it clattered by his house, simply carried on clipping his hedge. It was definitely over, and all that remained was a paddock stand (and the toolkit I’d forgotten to send back, obviously). So how do I feel about that? What is life like after the monumental Ducati 1299 Panigale S? Surprisingly okay, actually. My sense of loss is tempered by the fact that, by the end, I was riding this bike a bit too fast. Nonchalance and arrogance were creeping into my riding, too, and if I had been out walking my dog and seen another Tim Thompson on his Panigale I would have tut-tutted in hypocritical disapproval. On board, in the Panigale moment, the feeling was of pure uncut joy – that there is nothing a Panigale cannot or will not do for you. 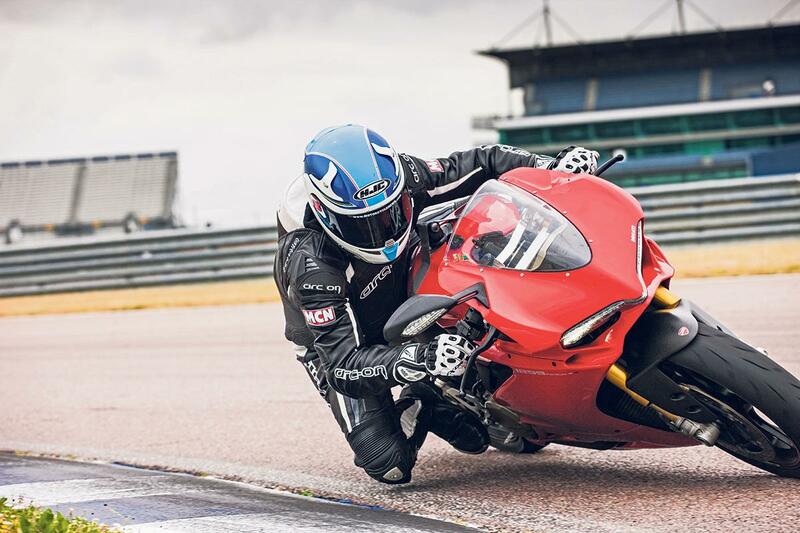 But afterwards, with ride-to-work records to work unintentionally smashed again, and perhaps another half-dozen harshly processed car drivers smouldering in my wake, I felt that my life with the Panigale was becoming unsustainable. My immediate feeling when the twin went back to Ducati was simply, phew, I got away with it. The mileage I did on the S was pretty low, under 5000 miles, with few journeys longer than 200 miles and sadly no sorties into the Alps or up to Scotland to report. But those local miles were more intense than any I can remember in all my biking years. Simply touching the bars before a ride dropped me into a zone, Panigale territory, and the shutters slammed down on the outside world. Most importantly for me those miles kicked into touch a lifetime reservation about Ducatis’ reliability – namely that they all break down all the time and often refuse to leave the garage altogether when it’s wet. The rear Öhlins shock was changed in a factory recall and it ate its front brake pads in just 3000 miles and used a little engine oil at first – but it ran faultlessly. It was no more trouble than a GSX-R750. And when the rain was bouncing off the tarmac and running down my neck not only did the lights stay on, it simply got better and better – brakes, steering and softer engine maps working in a helpful way I’ve never experienced on a fast Ducati before. Fuel consumption – 36mpg on road, low 20s on track – and excessive engine heat in town were irritants I learned to live with. Incredibly, the Panigale wiped the tread pattern clean off a rear Bridgestone RS10 in, wait for it, 400 miles, 150 of which were on track. But when I think of the torque that the bike puts into the tyre, and the grip the chassis finds, that mileage doesn’t seem quite so ridiculous. It arrived on OE Pirelli Supercorsa SPs – the benchmark for feel and grip – and left on Metzeler Racetec RR K3s, which were still in good shape after 1500 miles. Would I buy a Panigale S? Of course I would. Despite all I’ve said today, I’m worried that without one I will become slow and old. Okay slower and older! And I miss the flutter of butterflies as I counted down the minutes to each burst of Panigale madness. I would like to do more miles on the non S version, the one without the semi-active electronic suspension, just to see if you can have as much fun for £4000 less. That’s next for me.